Abu Dhabi is fast becoming a must for international Golfers, with world class golf courses at Abu Dhabi Golf Club, Yas Links and Saadiyat Beach. 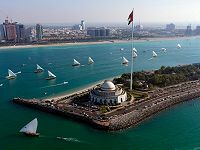 Abu Dhabi is located just 90 minutes from Dubai, with easy access through Etihad Airlines. The Westin Abu Dhabi Golf Resort and Spa (opened 2011) provides the perfect base for golfers, with direct access to 27-holes of Championship Golf, and located within 20 minutes of Yas Island and Saadiyat Beach.